CNG: Printed Auction CNG 75. BOEOTIA, Thebes. Circa 395-338 BC. AR Stater (12.24 g). Kabi-, magistrate. 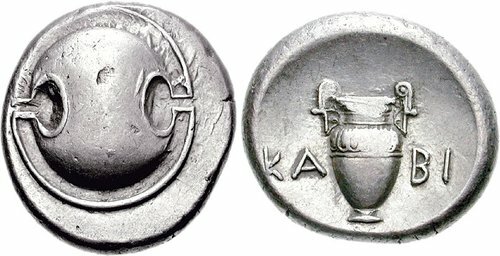 Struck circa 368-364 BC. Sale: CNG 75, Lot: 261. Estimate $300. Sold For $325. This amount does not include the buyer’s fee. BOEOTIA, Thebes. Circa 395-338 BC. AR Stater (12.24 g). Kabi-, magistrate. Struck circa 368-364 BC. Boeotian shield / Amphora; KA-BI across field; all within incuse concave circle. BCD Boiotia 539. VF, toned, minor die wear on obverse, small area of flat strike on reverse.